A readymade performance in the space of parliamentary politics. Between 02/13/2012 and 02/21/2012 Milan Markovic and Maja Pelevic became members of seven leading parties in Serbia: the Democratic Party of Serbia, the United Regions of Serbia, the Social Democratic Party, the Democratic Party, the Liberal Democratic Party, the Serbian Progressive Party, and the Socialist Party of Serbia. Soon after joining they became members of cultural councils, and even made the personnel lists in certain parties. The two presented their party colleagues with the text Idea-Strategy-Movement, in which they described their thoughts on the topic of the party’s cultural and marketing strategy. The text was well received by all the parties. The article was actually created using most of Joseph Goebbels’s speech Knowledge and Propaganda, made to his comrades in 1928. 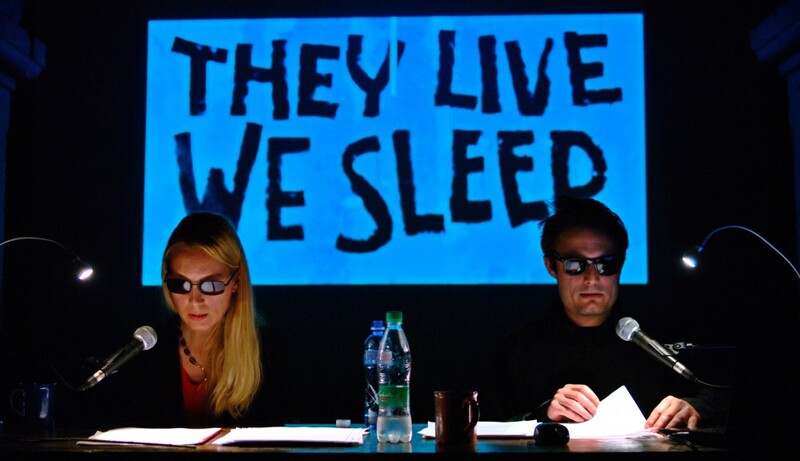 The public reading of They Live was supposed to take place on 17 March, 2012, at the Yugoslav Drama Theatre. On 15 March the authors were informed that the reading was being postponed and they were invited to present the text to the management. After that the reading was cancelled. The first public reading was held on 8 April, 2012, at Dom Omladine.